Why Convert PCD Files to JPEG? Download PCD, which stands for Photo CD, is a format for storing images on compact discs. It was developed by Kodak and if oftentimes used by professional photographers. Although PCD is characterized by great quality of images and high resolution, it has a number of disadvantages as well. First, these pcd files are relatively large (4-6 MB), which means they are difficult to share over the Internet. Second, PCD images can be hard to be accessed because not all CD-ROM drives can read them. There are certain applications that support PCD format. They include Adobe Photoshop, Pagemaker, and CorelDraw. However, all these programs are very expensive. As such, Adobe Photoshop is priced at $699, Pagemaker – at $499, and CorelDraw – at $439. If you want to process PCD files and yet to save as much money as possible, consider downloading PCD converter. This is a special program designed to convert PCD files to other formats, which are supported by a wider variety of applications. Typically, computer users choose to change PCD to JPEG format. Another option you have is downloading image converter. Unlike PCD convertor, this software is more functional as it supports not only PCD but other formats as well. 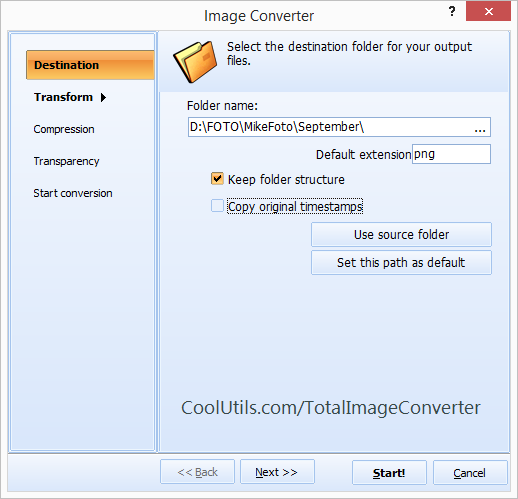 One of the best solutions available on the market is Total Image Converter. It was developed by CoolUtils, a software developer with extensive experience and expertise in design of file converters. 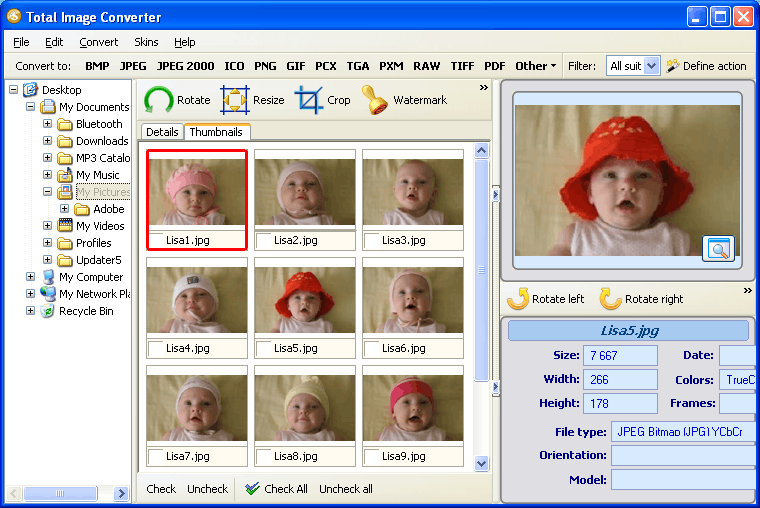 Total Image Converters has a number of advantages that make it very different from other applications for image processing. First, it has the widest selection of supported formats. As such, it can be used to convert PCD, JPEG, GIF, BMP, PCX, PNG, TIFF, RAW and many other files. Second, it is very functional. It can be used to edit PCD images (resize, rotate, crop), preview them and even place watermarks. The program is also perfect for conversion of photographs in batches. Third, it is very affordable. 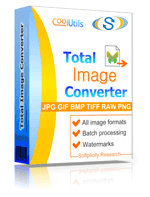 Unlike expensive programs like Photoshop, CorelDraw etc., Total Image Converter is available for under $20. 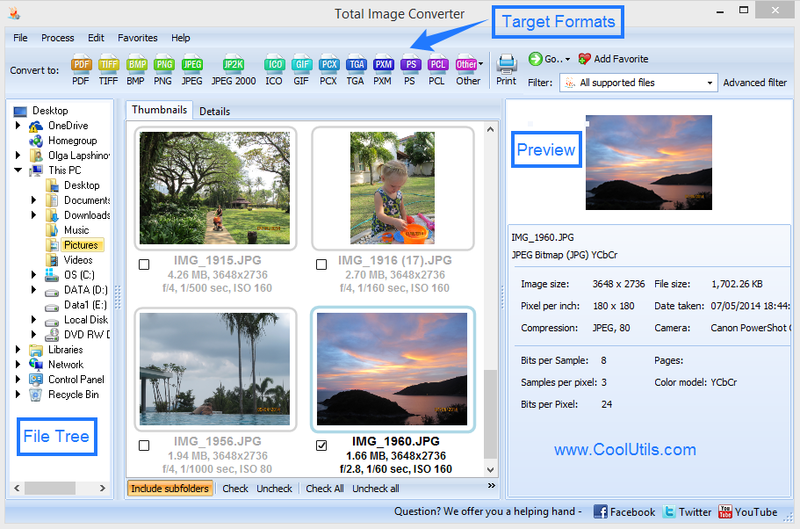 If you want to try the converter by CoolUtils, simply download it now and use it for free for 30 days!